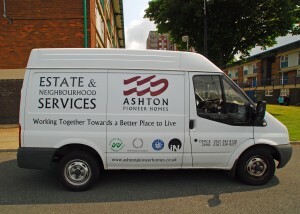 Ashton Pioneer Homes employ a team to carry out a wide range of services to over 900 homes across our two estates. If you wish to enquire about the additional services provided by the team, please contact our Customer Service Team. We employ a dedicated Estate Services Assistant responsible for ensuring our neighbourhood and estates are free from litter. If you have any litter concerns then please contact Customer Services during office hours.